The Verona Collection is Italian inspired herringbone patterns intertwined with tweed give a romantic yet masculine undertone to this stylish and sophisticated collection for a classic look. Designed with all the little details in mind, so your adventures in parenthood can be that much easier. 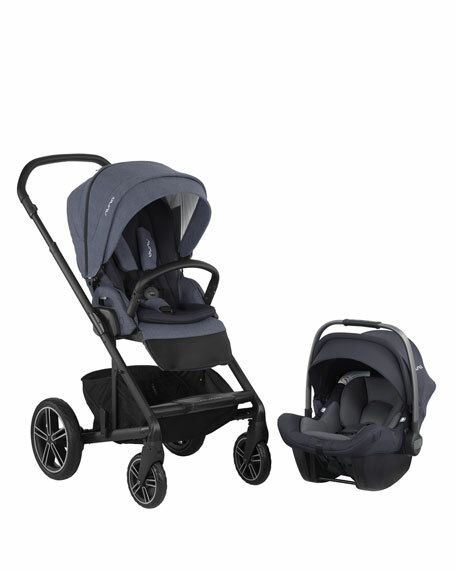 Nuna MIXX 2019 Travel System includes MIXX Stroller and PIPA Lite LX Car Seat. That's why we perfectly paired our versatile MIXX stroller with our featherweight PIPA Lite LX car seat to make one superb travel system. An ideal set for you, but especially for your little one. Removable and reversible two-piece bamboo seat insert grows with baby. Merino wool and Tencelbranded lyocell fiber is soft, naturally controls moisture and is environmentally friendly. Just 5.7 lbs. Ultra-portable and seriously protective. Plastic, aluminum, wool, polyester, Tencel. MIXX: 24"W x 37"D x 44"T.
PIPA: 17.5"W x 22.5"D x 27.3"T.